Gene began coaching at the East Brunswick recreational program at age 18. He served as a volunteer coach for four years with program. All of his teams were winning teams and one team went undefeated (8-0) to capture the league championship. While at East Brunswick Rec and at 19 years old, Gene was asked to coach simultaneously at Flipover Fitness in East Brunswick. His wrestling students at Flipover Fitness hailed from all parts of the state, and Gene helped several to become Kids State Champions and place finishers. He also instructed a high school wrestler there who took second in the NJ State Championships. Gene left Flipover to coach at a larger club called Over the Top, which was run from a church in Helmetta and which also drew students from a wide area of New Jersey. The club ceased operations when the right to use the facilities expired. The close of Over the Top prompted Gene to establish his own wrestling school, and he began modestly out of his home. One of his first students was a little known eighth-grader from South River named Tom Noto. Noto blossomed under Gene's tutelage and went on to win two New Jersey State Championships, a five-year full scholarship to Hofstra University and a second place in the High School National Championships. 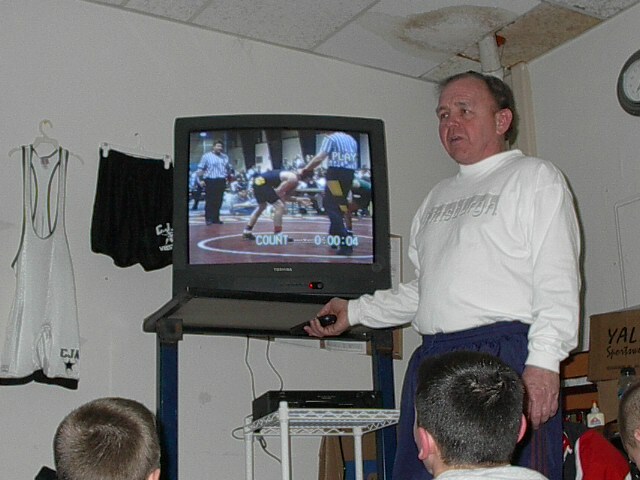 Word of Gene's unique style of teaching began to spread, and soon he was accepting other high school hopefuls into the temporary wrestling room that had once garaged his family cars. He even began to accept some younger wrestlers he called "little kids" who had demonstrated a penchant for and a commitment to excellence in wrestling. Simply by word of mouth, the club, temporarily dubbed CJA, was growing at leaps and bounds and occupying more and more of Gene's time and attention. Between 1998 and 2000, his students have had incredible success at all levels, and the name CJA (Central Jersey Annihilators) has become official with its July 2000 Grand Opening of new headquarters at 514 Georges Rd. in North Brunswick, NJ. There's a cryptic story about what the initials originally stood for, but interested parties will have to ask Gene about it directly. I want to produce an increasing number of champions at all age levels every year. Most importantly, I want to help each student achieve his own individual goals. I believe that philosophy will drive CJA well into the future. Attitude is the most important thing. I'm motivated by my athletes with good attitudes. No one likes to lose, but you must always keep your composure. Always remember, the classroom comes before the wrestling. Throughout my seven years of coaching, Donn Ernst has been my constant guide. Donn, my former high school coach, is an Olympic scout and currently teaching me how to be the excellent coach he was. Donn has coached champions at every level and has been a major reason for our club's success. Without Donn, I never would have learned so much so fast.